They sure know how to enjoy a picnic in South France. This sandwich version of a Salad Nicoise, the Pan Bagnat, is the perfect make-ahead dish to pack along in your picnic basket. 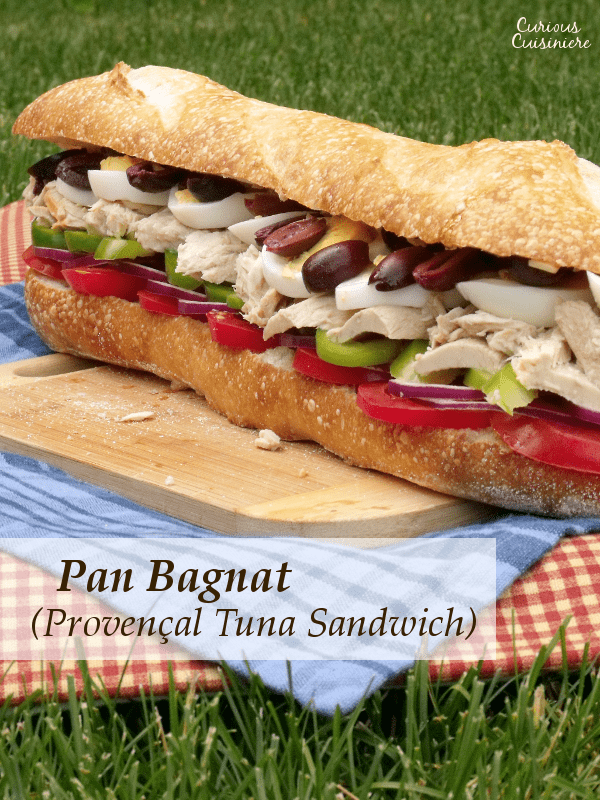 Pan Bagnat (pronounced pahhn ban-yah) is a sandwich specialty of Nice in the south of France. 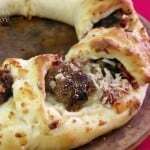 The name literally means bathed or wet bread, for the way the ingredients soak in and infuse the bread with flavor as it is pressed. 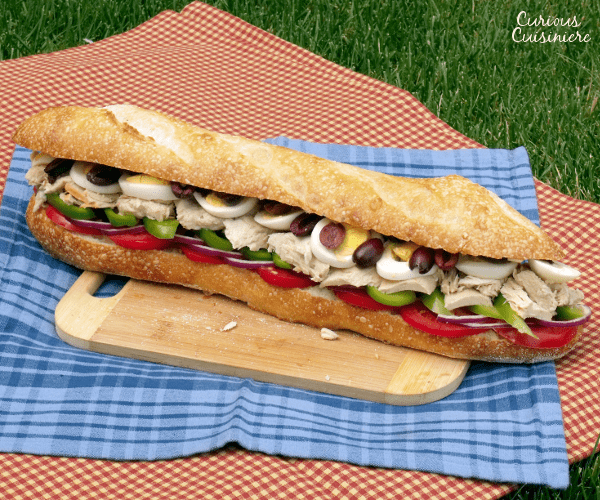 In southern France, the sandwich can be found in restaurants and cafés, but it is also common for families to make a pan bagnat in the morning and take it with them on an afternoon picnic. 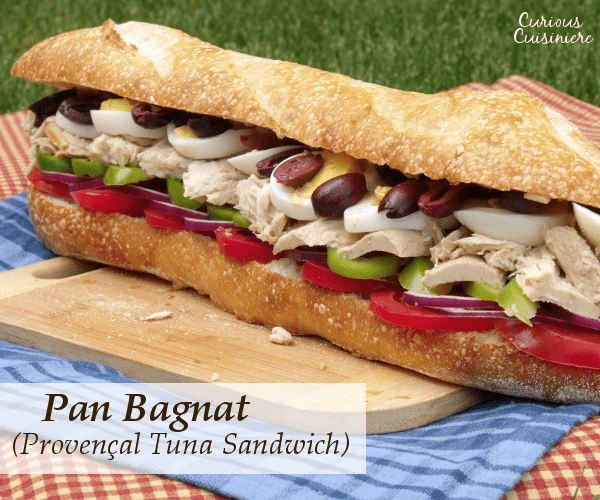 The pan bagnat sandwich is basically a portable version of a Salad Nicoise. 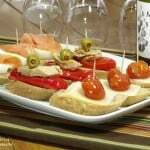 The bread is brushed with garlic and olive oil and then layered with tomatoes, onions, green peppers, tuna, anchovies, hard boiled eggs, and black olives. It’s all the goodness you would find in a classic Salad Nicoise. We opted to skip the anchovies in our sandwich, because Tim’s not a huge fan of them. To pick up on the salty flavor, we went heavy on the Kalamata olives which are as close as we can find to traditional Nicoise olives. 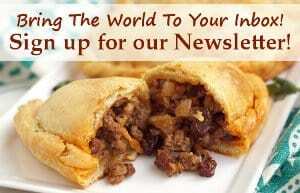 In France, it’s common to find a pan bagnat made on a slightly hollowed out, round loaf of hearty country bread. The sandwich is pressed to help the layers stay together and then sliced in to wedges for serving. We made our sandwich in the slightly less common baguette style. And, after using a baguette, we can understand why the people in Nice who make this sandwich often opt for a round loaf. Piling the layers upon layers of ingredients onto a long and skinny baguette becomes a sort of balancing act, and then, cutting the finished sandwich requires a bit of concentration to make sure you’re not loosing olives, eggs, and tuna. Once cut, wrapped, and pressed, the baguette version is incredibly easy to pack and eat however, making it perfect for taking along in individual servings for a picnic lunch. If working with a round loaf of bread, you would wrap and press the sandwich as a whole. 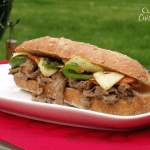 The firm, pressed sandwich is much easier to cut into wedges right before serving, making this version great if you need to serve a lot of people at once and have the ability to cut the sandwich as you serve it. Whether on a baguette or in a round, both sandwiches are equally delicious and equally as adaptable to what ingredients you have on hand. Add anchovies for their salty punch if you like, or leave them off. Throw in some red pepper or cucumber if you have it on hand. Or, swap the red onion for white or scallions if you prefer. Just make sure you have a good anchor of garlic, olive oil, tomatoes, a fish of sorts (tuna, anchovies, or even salmon), and hard boiled eggs. These are the staples that give this sandwich its classic flavor. Traditional recipes will have you use tuna that is packed in olive oil, because Mediterranean cooks love their olive oil. However, in the States, it can be difficult to find quality tuna packed in olive oil, so we decided to go with a solid packed tuna in water. That way, we could be sure about the oil we were adding and control the amount. If you have a trusted version of tuna packed in olive oil, give that a try for a more authentic version of the sandwich. The longer this sandwich sets (up to 24 hours) the better it gets, which is another reason it is a wonderful sandwich to make ahead and take along for a picnic or packed lunch. 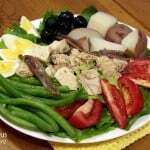 This sandwich version of a Salad Nicoise, the Pan Bagnat, is the perfect make-ahead dish to pack along in your picnic basket. Slice the baguette length-wise, all the way through, creating two long halves. Drizzle the garlic infused olive oil over the two halves of the bread. Layer the tomato slices, red onions, and green pepper slices over one of the halves. Continue layering the tuna, sliced eggs, olives, and anchovies (if using). Top the sandwich with the second half of baguette. Press the sandwich firmly to help keep the ingredients in place and cut the baguette into four even pieces. The sandwich can be eaten immediately, but for the traditional, pressed version that is great for taking on picnics, wrap each piece tightly in plastic wrap and place it under some sort of weight (a cast iron pan, a can of tuna, a plate weighted down with some bags of beans). Press the sandwich for at least 30 minutes, or it can be refrigerated and pressed for up to 24 hours. The longer the sandwich sets, the more the flavors will infuse. Let the sandwich come to room temperature before serving. 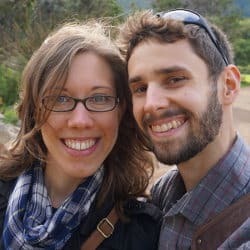 Today the Sunday Supper crew is bringing you a great collection of recipes to take along with you, wherever you are traveling. 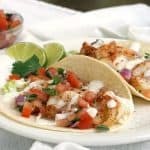 If your traveling on vacation, headed out for a picnic or pot luck, or bringing a dish to someone who could use a good meal, these recipes are sure to make your summer a bit tastier. Thanks to Marion of Life Tastes Good and Coleen at The Redhead Baker for hosting this week’s event. This looks like a great sandwich! Perfect for a picnic…. I am not going to thank you for the history this time because I feel like a broken record so instead just let me say……YUM!! 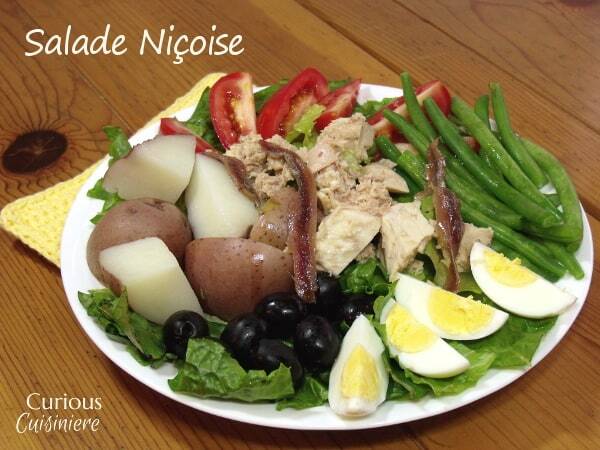 I never knew a pan bagnet was a twist on the Salade Nicoise! If that’s the case, I already love it!! It does sound amazing! Thanks Liz! It can be changed up so much, sometimes it might not be recognizable. But, the basics are still there! Love that this can be either a sandwich or a salad, great idea. Oh my goodness, so yummy! What a beautiful sandwich! I am totally in love with this sandwich, you have taken my favorite salad and brought it to new heights!! Wow! What a great sandwich, Sarah! I love that it gets better if you make it ahead. Perfect for a car trip! Thanks Stacy. It’s a great sandwich when you don’t want to worry about food at the last minute. I know where I’m taking this. It is perfect for a summer picnic night at the Hollywood Bowl. Looks so good and impressive to go with some wine and live classical music. That sound like a perfect dinner and night out Chris! I have made a pressed sandwich much like this before, and we love ’em! I’ll have to try it with these flavors as it sounds amazing and picnic perfect! Thanks for sharing! We will be doing more pressed sandwiches now that we know how great they are for packing! 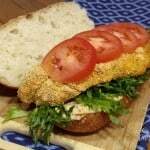 I’ve been on a tuna sandwich kick lately and looking for something different than the variations of tuna salad. This is just what I’ve been looking for. Yummy! This is such a great way to break from the classic tuna salad! 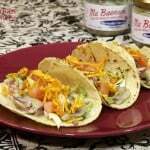 And, it’s a great way to get non-tuna salad eaters to eat tuna!